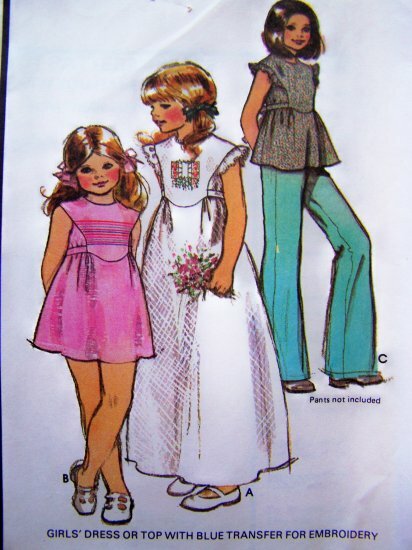 1977 Vintage Sewing pattern McCall's # 5534. Girls vintage size 7. Vintage dress or top. Back zippered dress A, B or top C has extended shoulder line, tie belts included in upper side front seams. A with trimming or C has ruffles. More vintage and new sewing patterns listed at both of my stores. Measurements: B 26". W 23". H 27". Back waist length 11 1/2 ". ** Part Cut, cut for view B with longer pieces included, all pieces included with instructions. I have more womens and misses new and vintage patterns listed in my store. *Some envelopes are torn, have writing or yellowing from age, some may have a wrinkled piece, most don't. I only tape an envelope when it is necessary to keep the pattern in the envelope. S & H to the USA is $2.00 and $1.00 each additional pattern. S & H to Canada $3.00 and $1.00 for each additional pattern. **International: Paypal only. S & H $4.00. Looking for a certain pattern? I have over 6000 patterns in stock and I may just have it! I do combine shipping between both of my stores! OVER 1000 POSITIVE FEEDBACK AT MY EBAY STORE ! !